Nandamuri Taraka Rama Rao, also known as NTR, was born in 1923 in a well-to-do family in Andhra Pradesh. He showed interest in acting and singing from his childhood. During his higher studies he met Jaggayya at the Andhra Christian College (of Andhra University) and they became friends. Both of them participated in several college dramas. After graduating from Andhra University, he founded a drama company called “National Art Theater (NAT)” and started staging the plays. Savithri also worked with NTR in his theater group. In 1949, Rao had an opportunity to star in a supporting role in the Telugu film “Mana Desham,” directed by L.V. Prasad. The very next year he appeared with Akkineni Nageswara Rao in “Samsaram”. When this movie became a huge success, there was no turning back for NTR. With good looks, he established himself as a force in the Telugu film field. What made NTR particularly popular was his portrayals of mythological characters. He appeared in so many movies depicting either Rama or Krishna that people started hanging his pictures from these films on their walls at their home as if he was the real Hindu god. Rao had a prolific acting career, and by one estimate, acted in over 300 films. He also produced and directed films and wrote screenplays. In his 44 years of film career, Rama Rao had acted in about 297 films, out of which 280 are Telugu, 15 Tamil and 4 Hindi films. 44 of his films were mythological, 13 were historical, 55 fictional and 185 films were social. 140 of his films celebrated hundred days and 33 films celebrated silver Jubilees while six of his films ran more than 50 weeks. 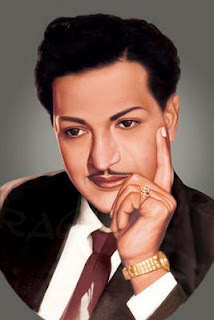 In 1950s NTR was the most cherished hero who was acting in 10 films per year. His film ‘Lava Kusa’ an all time hit, which was released in 1963, made a record by running 75 weeks in a center and 100 days in 63 centres. For his film ‘Maya Bazaar’ for Lord Krishna’s role, which was released in 1956, Rama Rao took Rs.7, 500/-, which was said to be the highest remuneration in those days. For about 22 years since he entered into films Rama Rao’s remuneration was around 4 or 5 digits. From 1972 it had grown to one lakh for each film and after some time, it went up around 7 lakhs onwards. NTR was a strict disciplinarian. He used to practice hard on the shores of marina Beach at Madras, to retain his bass and echoic voice for excellent dialogue delivery and base modulations. When he was in his forties and was working for the film ‘Narthana Saala’, he learnt Bharath Natyam at Vempati China Satyam to make the role justified. Such was NTR’s dedication towards his profession. He never stumbled or stammered in front of the camera as he used to take all the dialogues by heart when he was doing a particular film. He woke up early always and never missed doing physical exercises. In 1982, NTR decided to enter the political arena. He founded the Telugu Desam Party and campaigned tirelessly to overthrow the then Congress Government that was in power in Andhra Pradesh state for many years. He won the elections easily and became the Chief Minister. He was elected three times as Chief Minister, but lost his post as the head of the state due to a power conflict with his own party.He was awarded a number of awards by both the state and also central government. N.T.Rama Rao passed away in 1996 after a massive heart attack.